The longevity of business depends highly on its marketing strategies so does the success of a product. Marketing itself has evolved and has embraced technology. 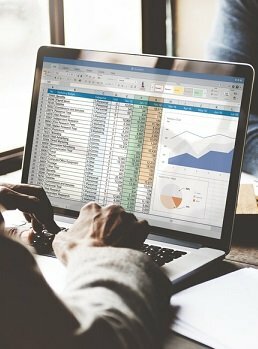 It has become ever more important to understand the expanse of its impact and the newer areas, techniques where marketing tools and concepts are being deployed. Not to forget analytics. For Indian Participants – Graduates (10+2+3) or Diploma Holders (only 10+2+3) from a recognized university (UGC/AICTE/DEC/AIU/State Government) in any discipline with minimum 50% marks. Only candidates who have paid the application processing fee of INR 1,000 + GST/ USD 20 and have passed Talentedge Admission Assessment (TAA), will qualify for enrollment. Working professionals with a minimum of 5 years of work experience. Currently working as Dean (Noida Campus) he has been awarded six times as "Best Faculty" in the row. International teaching experience has taught in six universities abroad as a guest faculty. Research interests include consumer culture, the bottom of the pyramid, inter-organization dynamics, religion impact on marketing and consumer insights of goods, services in B2C and B2B. He has publications in various refereed category journals. His cases has published at Richard Ivey and listed at Harvard Business School Press. He has a blend of industry and academics experience. 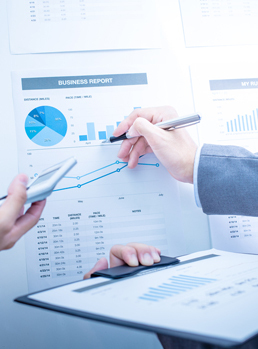 Knowledge and practical expertise extend across the fields of business, marketing, sales, and distribution. 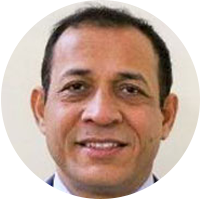 His consulting and training experience include public sector, private companies, and government department, some of his client list includes Lafarge Cement, Abbott Limited, Groz Engineering tools, Shakti Pump, Mahindra and Mahindra Finance Limited, and SPMCIL, to name a few. 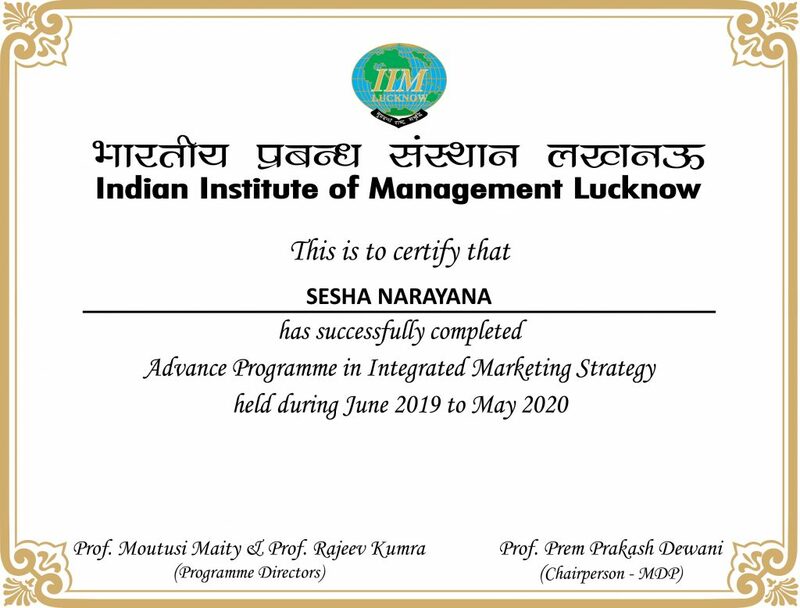 Post the payment of all due fees and upon satisfying the requisite attendance & evaluation criteria of the Advanced Program In Integrated Marketing Strategy, participants will be awarded a certificate of completion issued by IIM Lucknow. Rest will be awarded a participation certificate. The primary method of instruction will be through LIVE lectures that will be beamed online via Internet to student desktops/laptops or classrooms. The pedagogy will comprise of theoretical lectures, case discussions, leadership seminars and group-based problem solving imparted by IIML’s faculty. All enrolled students will also be provided access to the Cloud Campus through which students may access other learning aids, reference materials and assessments, case studies, projects and assignments as appropriate. Throughout the duration of the program, students will have the flexibility to reach out to the professors, real time during the class or offline via the Cloud Campus to raise questions and clear their doubts. A minimum of 70% attendance to the LIVE lectures is a prerequisite for the successful completion of this course. 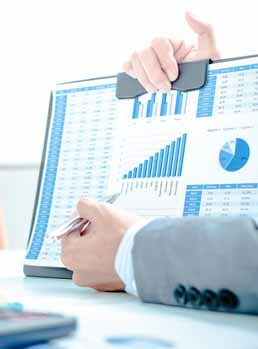 There are periodic evaluations built in throughout the duration of the program. These maybe in the form of a quiz, assignment, project, case studies or other objective/subjective assessments. The evaluations are designed ensure continuous student engagement with the program and encourage learning. 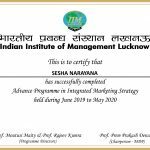 Participants who successfully complete the same along with the requisite attendance criteria, an end program assessment and project work will be awarded a certificate of completion by IIM Lucknow. Established in 1984, The Indian Institute of Management, Lucknow is 4th in the prestigious IIM family of management schools in India. The establishment of IIMs was envisioned and initiated by the first Prime Minister of India – Pandit Jawaharlal Nehru. It offers courses accredited to AMBA, AACSB & NIRF. The mission of IIM Lucknow is to improve management systems with regard to business, industry and public services through pursuit of excellence in management education, research, consultancy and training. It aims to be a preeminent centre of excellence, generating and imparting knowledge in management and providing socially conscious and globally relevant thought leadership. IIML moulds its students into value driven leaders, managers and global players. It nurtures value based young leaders who are capable of driving social and economic transformations towards an ethical, just and sustainable society. It encourages and develops individuals having entrepreneurial spirit and actions capable of solving societal problems through innovative and sustainable business models. The faculty of IIML are teachers in the true sense of the word – people who impart knowledge that is kept continually updated. The institute undertakes a diverse range of academic activities aimed at creation, dissemination and application of management knowledge and practice. It is an ideal setup conducive to learning, accessibility and excellence. The academic counsellors at Talentedge will check with the interested candidates for initial scrutiny of eligibility against specified eligibility criteria. After receiving the required information from the candidates, qualifying candidates will register themselves at Talentedge website and pay Rs.1000 + GST / USD 20 towards the application processing fee. This amount will NOT be refunded to candidates. 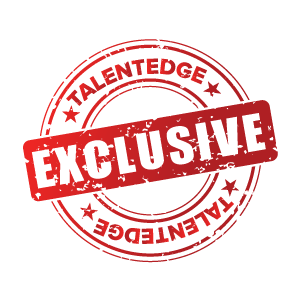 Candidates will then be required to take an online Talentedge Admission Assessment (TAA). A sample of TAA’s questions can be accessed here. Upon clearing the TAA, candidates will thereafter proceed to pay the fee as per the schedule. Candidates will also be required to complete a detailed application form and furnish soft copies of necessary documents. 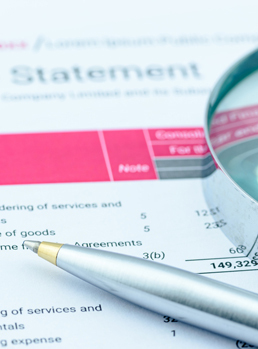 If you have any questions about the kind of supporting documents that needs to be uploaded, please speak with our counsellors who will be able to guide you through the process. Should you require any assistance with financial loans, our counsellors will be happy to support you with the guidelines for the same. However, the decision to grant the loan will depend on the adequacy of documents submitted and will be at the sole discretion of the respective financing agency/bank. The loan itself will be based on a mutual agreement exclusively between the individual candidate and the financing agency/bank and Talentedge will have no role whatsoever in this financing arrangement between the two parties. In case payment is being made online through Credit Card/Debit Card, please ensure that you have the Credit Card/Debit Card with you at the time of filling out the Application Form. If you have opted to pay the Application Fee/Instalments of the Fee through Demand Draft/Pay Orders, then please ensure that the Demand Draft/Pay Orders for the applicable amount is made favoring “IIM Lucknow” payable at IIM Lucknow and is sent to the address provided below along with the downloaded copy of your Application Form. Please ensure that you write your Name, REGID, Course Name and Contact number at the back of your Demand Draft/Pay Order. All the information and documentation provided by you at the time of enrolment will be duly verified by the Institute and if it is determined that the information and/or documentation provided by you is inadequate and/or does not substantiate the entry requirements and prerequisite criteria to the course, then your enrolment to the course will be cancelled with immediate effect and the instalment of the course fee paid by you to Talentedge at the time of registration, will be refunded to you. The Course fee is payable in instalments as per the instalment schedule provided. In the event of late payment of Instalment 1 or any other subsequent Instalments, a Late Fee is leviable as follows. A Late fee of INR 1000 + GST will be charged to the Participant, if the instalment is paid within 7 days from the due date published on the instalment schedule. A Late fee of INR 2500 + GST will be charged to the Participant, if the instalment is paid between 8 days from the due date to within 14 days from due date as published on the instalment schedule. If the Fee Instalment is not received within 14 days from the due date, then the Participant shall be considered a dropout and a Rejoining Fee of INR 5000 + GST will be charged to the Participant if the Participant wishes to continue with and complete the Course and rejoining can be accommodated as per Course guidelines. In event that such valid requests for refund of fees are received, the application money shall be refunded after deducting a penalty of INR 5,000 + applicable taxes & USD 125 for foreign participants. A participant may opt for rescheduling to a later batch of the same course / another course of prior to commencement of the course. However, such intimation must be made by the participant at least fifteen days prior to the commencement of the course. The amounts paid by the participant shall be considered as advance payment towards the next batch / alternative course. Further, the participant shall have to pay an administrative charge of INR 5000 plus applicable taxes (Indian participants) or USD 125 (foreign participants) for facilitating such rescheduling. Talentedge & the Institute, reserve the right to cancel courses at any time owing to reasons like insufficient enrolments, trainer indisposition or force majeure events. In the event that Talentedge or the Institute cancels a scheduled course, the student will receive full fee refund for the same. All refunds will be processed within 30 days of receipt of a valid refund request. Note – Application processing fee of INR 1,000 + GST / USD 20 will NOT be refunded to candidates (in case candidates fail to pass the entrance exam).